This design was inspired by Japanese kanji symbols. There are over 50,000 such symbols, of which the average educated Japanese adult recognizes about 3,500. Knowledge of about 1,000 kanji symbols is needed to read a Japanese newspaper. I found the history and structure of these symbols to be so interesting that I wanted to design something in glass to show how unique this language is. The design is done in copper foil. The panel measures 15¾" tall by 19½" wide. It was designed to fit into a wrought iron display stand which I purchased from Southern Front Stained Glass and Doors. The display stand purchased was the medium panel stand, 16½" tall by 20¼" wide which holds a panel 12 5/8" x 17". The panel can be used as a fireplace screen. Design tips would be to keep this panel square and be sure to keep it the correct size so that it will fit into your stand. I would recommend buying your stand first as that way you can always modify the panel size to fit your stand before you start your project. The stand comes with hanging hooks, which are soldered to the seams on the border to add strength and support due to the size and weight of the finished panel. I also did a round version of the kanji symbol for "happiness". 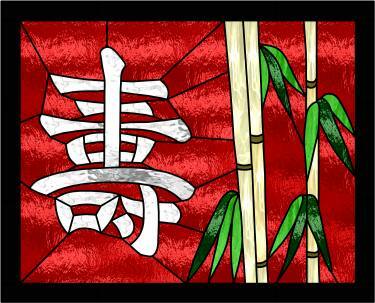 I used the black and red glass commonly found in oriental design and contrasting clear glass for the symbol. The design fits into a standard 12" round oak frame. Both of these were fun to make and neither were difficult. With so many kanji symbols to choose from you can let your imagination go wild. There are many web sites that provide free kanji images as well as translations from English to kanji. I have found Glass Eye 2000 to be one of the best programs around, and I know that I would be lost without it. To be able to import any photo and then create a pattern from it makes a world of difference in the finished project. The patterns are always precise in size and flawless in design. I am not gifted at drawing or painting so this software has opened up a whole new world for me. Thanks to Glass Eye 2000 and Dragonfly Software for making my glass designs a success! Debby lives in Lodi, California. She made her first stained glass project in 1972, but hardly touched her tools in the 80's and 90's. Three years ago she returned to the craft and has been doing projects ever since. She has sold several artworks but mainly creates custom-designed gifts for friends and family. See Debby's creations at her website or send her an email.